Salem resident Edward Carroll announced that he's running in the democratic primary for state senate, against Mary-Ellen Manning, John Slattery, and Joan Lovely. It's a pretty massively huge coincidence that his landlord is also his opponent, Mary-Ellen Manning. Maybe it's just a coincidence, but I have a hard time buying that. My guess is that one of two things must be true. Either Mr. Carroll really hates his landlord, or really likes her. I'm sure both would claim it's a coincidence, but I can't really believe that. Insiders tell me that they believe that Manning asked Carroll to run, so that there would be two Salem residents on the ballot, hoping to pull Salem votes away from Joan Lovely in her own backyard. The joke, of course, is on Manning (and maybe Lovely), if this is true. Because, we all know, Salemites don't vote, especially in primaries. All those signatures gathered for nothing. If you saw the blog post "Patch Asleep at the Switch," which was posted on Salem Patch for a few days, but has since been removed, you'd have a hard time taking Mr. Carroll's campaign seriously. Let's just say that the spelling, grammar, and punctuation in this post touting Mr. Carroll made the piece almost unreadable. It also read like something from the free republic, right wing nutjob play-book. It would seem odd that if Mr. Carroll shared the beliefs of that particular supporter, that he would be a much better fit on the (also less crowded) Republican ballot. Something fishy there. The Carroll campaign doesn't appear to have any sort of web site, phone number, Facebook page, etc. Oops, someone didn't open the mail! Still haven't decided who I'm voting for on Thursday, Sept. 6. Thoughts? Salem mayor Kim Driscoll will face her toughest opponent since her first election in the next mayoral go-round. Of course, when the toilet tipper was your last opponent, that's not saying much. Current ward 2 councilor Mike Sosnowski hasn't been quiet enough about his intention to jump full force into the next mayoral election. Though he hasn't made any official announcements, he's told many supporters that he fully intends to run. Can he cobble together enough special interests to defeat a mostly popular incumbent? We'll see. I tend to doubt it, but the longer someone sits in office, the more people they piss off. Sosnowski is sure to lend a sympathetic ear to people who oppose lots of different things. A short list would start with wind turbine, transfer station, parking meter, 40b housing, Saltonstall special treatment, Bridge St senior center, increased liquor licenses, and/or condos without parking spaces opponents. His game will need to be cobbling together enough people who will be single-issue voters on those specific issues, plus whatever else comes up in the next year. (See why it gets harder and harder to keep office the longer you're in it?) The longer that list gets the easier for a challenger. Maybe he does have a shot. He'll do well with the old Salem, lifer, don't want to vote for a woman crowd, too. Then again, maybe I pay too much attention to the Patch/Snews/Salemweb fellowship of the miserable. I was convinced that councilors Pinto and Ronan would win in a landslide as well. In hindsight I'd probably take Pinto back. Carr is bo-ring. Council on a whole has been pretty boring. Nobody ran against Sosnowski last go around in Ward 2, but I hear it's not his intention to file papers for both the mayor's seat and the ward 2 spot. It's wise, don't be a Sawicki. Any chance that Ward 2 has nobody file to run? Big Metal Box is gone. (What did that cost us?) I guess we could see a retread. Claudia Chuber is in Ward 2 now (not sure what the museum would think of her running for office with her new role with them), as is frequent candidate Mike Blatty, who hates seeing people run unopposed. It would be ironic if he got elected that way. Should be an interesting mayoral race in 2013, probably offering residents a stark choice of two pretty different visions for the future of the city. Klassy, thank you for bringing up the public notice about my home and keeping an open mind about your choice come September for State Senate. This is a notice, not a final judgment...my home was not foreclosed on...and my husband and I are up to date. It's true that like 1,887,777 people in 2011 in the same situation, we struggled in this dreadful economy as part of the domino effect impacting so many. Sadly, most were not able to fight their way out of it and lost their homes. Despite the impact on our finances, I worked with my tenants who struggled, and managed to house a homeless veteran for free here until he could secure public housing. Now that these private struggles have been made public, I can tell you that I'd do it all again. Let me share with you what what my little sister Anne (Peabody City Councillor) said to me at the time when I alerted her that this was going to be in the newspaper so she and my brothers would hear it from me first rather than be embarrassed: "I am so proud of you for being able to pull yourself out of this jam and being able to be compassionate to John and keeping him from being homeless again. I don't know many people who would do that. Don't be embarrassed—be proud. This is how we were raised. Mom and Dad would be so proud of you." I understand the struggles of everyday people because I am one myself, and you can count on me to help our community get through this together if I'm elected to the State Senate. So, Klassy, thanks again and please consider me in September. Mary-Ellen Manning, 80 Lowell Street, Peabody, MA 01960, (978) 740-1090. P.S. Feel free to drop by for a scoop of ice cream...my treat...on Sunday, May 20, from 2-4 at Treadwell's Ice Cream in Peabody. Well it looks like whoever did the research that Klassy is taking credit for forgot to remove the comment on the bottom of the screenshot. Thanks Mary-Ellen for sharing your story that is similar to the story so many people have shared in over the last few years. Congratulations on coming out on top and helping others at the same time that you were struggling. Klassy, it is not very classy to post incomplete research, especially only sharing an allegation to portray someone in a negative light. Perhaps you should have noted that the foreclosure matter has been resolved in Mary-Ellen's favor. What comment? The caption I added to the photo when I uploaded it? That was mine. 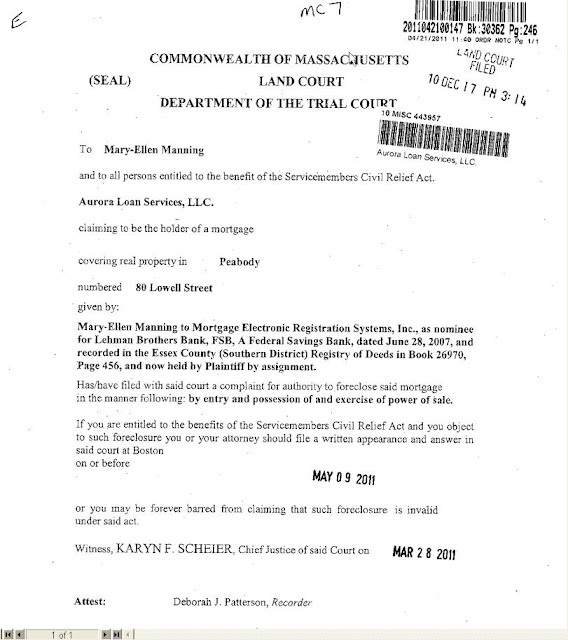 I did a simple name search on the Salem Registry of Deeds site to fact check the claim that she is Mr. Carroll's landlord. The foreclosure complaint came up in that search. I make no value judgement on that information at all. It is public record, and in an election in a state that has a woeful track record for sound fiscal management, I posted it because I'm sure to some it will matter. Ms. Manning's forthright explanation is exactly the kind of openness I value in a candidate, and I give her credit for it. I did notice that Ms. Manning had no comment on her relationship with Mr. Carroll, and whether she played any role in his decision to run, as others allege. Klassy, I noticed that you had "no comment" of your lack of complete research. Your post might matter to some, which is why your presentation of a half truths should matter to YOU. That's not Klassy. That's just rude. After you screwed that up, why would she respond to your ruse to spread a rumor? I think I will follow her lead an no longer respond to you. Good day, sir. I said she had one of her properties in foreclosure. She did, as her mortgage company filed a foreclosure complaint. I never said they took the property. You never said they didn't. Half truths. You're rude. I think we all may recognize that, while unwanted and inconvenient and perhaps even embarrassing, a first notice of bank activity is not the end of the world. This is especially true in today's difficult economy. I think most would agree that something like this would never be enough to deter them from supporting a candidate that is the best suited for the job at hand. I am an enthusiastic Manning supporter, and have been since I first noticed her stands which consistently put voters first ; even when they put her at odds with her party's bigwigs. I admire that as a wonderful and all-too-rare trait in this one party dominated state. Likewise, I question the common sense of the conspiracy theory that suggests that recruiting an unknown and inexperienced man to run in order to draw votes from a nice woman who is well known in her hometown would have any effect at all. In fact, it seems pretty naive. Would voters who are so easily swayed as to vote for a man they never heard of just because he is from Salem really be motivated enough to go to the polls? It seems that someone felt that these points would somehow benefit Lovely. I disagree. I believe it makes her camp look over eager for some "gotcha" issue. Why not just highlight her positives and let the voters decide? G, I love your blog and think you do a good thing for Salem. As for this post I found it interesting and witty as usual and you got me thinking about a race that really wasn't on my radar yet. Because of this post and the response it drew from Mary-Ellen I want to know more about her. So far( her willingness to respond) I like what I see. For those who are curious, like Anonymous, and want to know more about me and my campaign for State Senate, visit www.maryellenforsenate.com. You can send a direct e-mail to ask questions or you can call me at (978) 595-1029. I'd like to know more about all of you, too, and about what your concerns are.